You may remember the arch conspiracy theorist, Alec Rawls. I dissected several of his conspiracy theories a while ago. Today he's a bit more muted in his science denial at WUWT (archived here). He's decided he accepts solar physics but still can't come at climate science. Mike Lockwood, professor of space environment physics, from the University of Reading, thinks there is a significant chance that the Sun could become increasingly quiet. "It's an unusually rapid decline," explains Prof Lockwood. "We estimate that within about 40 years or so there is a 10% to 20% - nearer 20% - probability that we'll be back in Maunder Minimum conditions." The era of solar inactivity in the 17th Century coincided with a period of bitterly cold winters in Europe. And Prof Lockwood believes that this regional effect could have been in part driven by the dearth of activity on the Sun, and may happen again if our star continues to wane. ..."It's a very active research topic at the present time, but we do think there is a mechanism in Europe where we should expect more cold winters when solar activity is low," he says. He believes this local effect happens because the amount of ultraviolet light radiating from the Sun dips when solar activity is low. This means that less UV radiation hits the stratosphere - the layer of air that sits high above the Earth. And this in turn feeds into the jet stream - the fast-flowing air current in the upper atmosphere that can drive the weather. The results of this are dominantly felt above Europe, says Prof Lockwood. "We estimate that within about 40 years or so there is a 10% to 20% - nearer 20% - probability that we'll be back in Maunder Minimum conditions." "These are large meanders in the jet stream, and they're called blocking events because they block off the normal moist, mild winds we get from the Atlantic, and instead we get cold air being dragged down from the Arctic and from Russia," he says. "These are what we call a cold snap... a series of three or four cold snaps in a row adds up to a cold winter. And that's quite likely what we'll see as solar activity declines." So could this regional change in Europe have a knock-on effect on for the rest of the world's climate? And what are the implications for global warming? In a recent report by the UN's climate panel, scientists concluded that they were 95% certain that humans were the "dominant cause" of global warming since the 1950s, and if greenhouse gases continue to rise at their current rate, then the global mean temperature could rise by as much as 4.8C. Prof Lockwood says that while UV light varies with solar activity, other forms of radiation from the Sun that penetrate the troposphere (the lower layer of air that sits above the Earth) do not change that much. He explains: "If we take all the science that we know relating to how the Sun emits heat and light and how that heat and light powers our climate system, and we look at the climate system globally, the difference that it makes even going back into Maunder Minimum conditions is very small. "I've done a number of studies that show at the very most it might buy you about five years before you reach a certain global average temperature level. But that's not to say, on a more regional basis there aren't changes to the patterns of our weather that we'll have to get used to." There is a 10 to 20% chance that the sun will be in Maunder Minimum conditions by 2054 or so. Conversely, there is presumably an 80 to 90% chance that it won't. Even if it is, it will only take five years or so for temperatures to get to where they would have been without the lull in the sun. If the sun changes as suggested it may affect the jet stream, bringing cold snaps during the northern hemisphere winters. One has to make a very clear distinction between regional climate and global climate. If we get a cold winter in Europe because of these blocking events it’s warmer, for example, in Greenland, so the average is almost no change [a completely unsupported conjecture that is at odds with reason and evidence A.R. 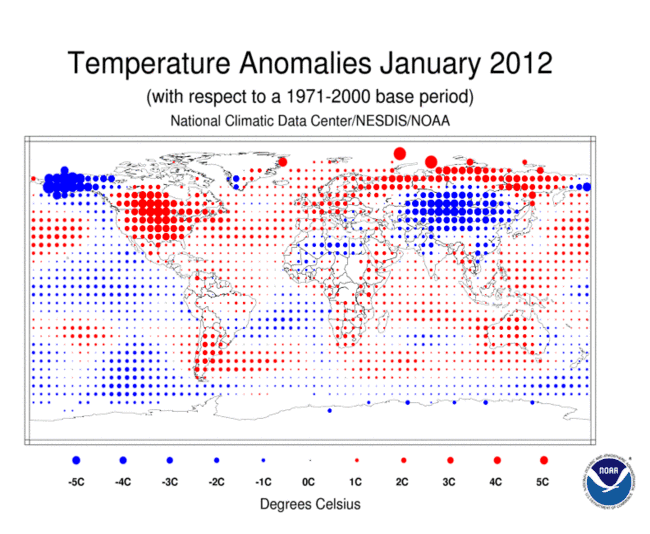 ], so it is a redistribution of temperature around the North Atlantic. So I looked to see the support Alec Rawls gave for his own conjecture (that it is at odds with "reason and evidence"). Alec Rawls is trying to claim that blocking events are not regional and the energy is not balanced by it being warmer elsewhere. And I found nothing, zero, zilch. Alec Rawls made a "completely unsupported conjecture that is at odds with reason and evidence". In the video below, you can see that the jet stream doesn't "add cold", it just moves hot and cold air to different places. So Alec Rawls was wrong in his unsubstantiated conjecture and Mike Lockwood was correct. A Grand Minimum wouldn't make much difference. It would reduce global temperatures by about 0.3 degrees Celsius, which isn't much when you consider that temperatures are heading for 2 degrees, 4 degrees or 6 degrees higher - depending on the amount of greenhouse gases we throw up into the air. Great Post Anthony and Alec, and thanks Stephen Wilde. It’s great to to see the extent of the Sun’s role being admitted finally. January 19, 2014 at 8:42 amIf only some study had proven the link between Sun and climate… some have gotten close, but lose correlation at some point. There is too much we have yet to understand about Solar/planetary climate interaction. I disagree with much of what Professor Lockwood said, but he was correct that any discernible differences the Sun makes in our climate have been small. If we do enter a LIA then this will test the idea whether LIA was regional or global. Furthermore, it would put to rest SkS’ idea that co2 is now the main climate driver. In fact that has been to to bed by 16 years of no surface warming. HAL-9000 says: January 19, 2014 at 8:44 am A million-mile wide eternally detonating hydrogen bomb in the sky affects temperatures? Stop the presses. The Sun is not a detonating hydrogen bomb. Its energy production is comparable to that of a compost heap [ http://en.wikipedia.org/wiki/Compost ]. Sorry people, I think we have to be very careful of taking this at face value. Bear in mind that the Little Ice Age was already cold, and the Dalton and Maunder minimums were just the icing on the cake, so to speak. If what happened then recurs now, then we will descend down to the temperatures we saw in the ’70s at best. That’s more than a “pause”, but hardly alarming. If this gains traction, it gives the alarmists and the media an out for all their pronouncements on global warming. They can legitimately say (in their minds at least), that they couldn’t possibly have predicted this. They can hype this up as having the potential to bring us into another little ice age, and when it doesn’t (and it won’t), then say that global warming must be “worse than we thought”. They can further say that once the sun gets active again, and it will, global warming will return with a vengeance, so we need to keep the pressure on on CO2. It also allows them to say that if it had not been for this unprecedented event, then their models would have been validated. You and I know that they will be blowing smoke, but the public at large won’t. This could end up being the worst of all worlds for people on the skeptic side of the argument. We can be painted as having been right (temporarily), but for the wrong reason. Ergo, we should continue to be ignored. Let’s keep our eye on the pea under this particular thimble. Note drop in CH4 into 1600AD (b). Sapart etal ascribe CH4 drops especially to wars that destroyed rice paddies, etc. 2) natural, but not solar. 3) Solar ... but it was already cold. I know this is off topic, but I don't know where else to put it since you closed "The Gallop" thread. I think your idea of a separate blog to partition out persistent trolls is a good one. We all know countless examples where these idiots have derailed the discussion. One could think of it as a Quarantine page, where these troublemakers are banished, to stop them infecting other blogs. There, you can make them address just a couple of their points, not allowing them to change the topic or "Gish Gallop". If they persist in their unsavoury behaviour after having been given the chance to reform, ban them, as you did with Greig. Case in point, the "cause of ulcers/Galileo/Einstein (insert example) was against scientific consensus therefore consensus means nothing" meme. This is a logical non sequitur, and has nothing to do with climate science. It is pure logical deduction, plain and simple. If the troll cannot be made to understand this simple logical fallacy (and admit it publicly), then there is no point in wasting any more time on them. They can never be made to comprehend anything more complex and nuanced. Ban them like you did Greig. Then as you say, that blog thread can be held up as an example to others. Oh no, not Alec Rawls again, the Flight 93 Families bully. Alec Rawls is a conspiracy nutcase and Dunning-Kruger patient and WUWT giving him a platform only further confirms Prof Lewandowsky's findings. The climate of the past millennium was marked by substantial decadal and centennial scale variability in the Northern Hemisphere. Low solar activity has been linked to cooling during the Little Ice Age (AD 1450–1850; ref. 1) and there may have been solar forcing of regional warmth during the Medieval Climate Anomaly (AD 950–1250; ref. 1). 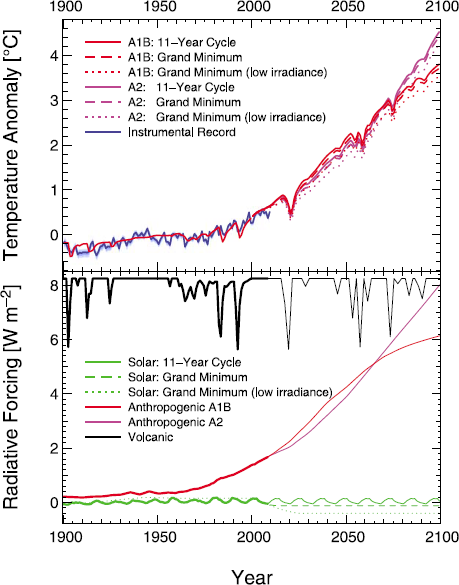 The amplitude of the associated changes is, however, poorly constrained, with estimates of solar forcing spanning almost an order of magnitude. Numerical simulations tentatively indicate that a small amplitude best agrees with available temperature reconstructions. Here we compare the climatic fingerprints of high and low solar forcing derived from model simulations with an ensemble of surface air temperature reconstructions for the past millennium. Our methodology also accounts for internal climate variability and other external drivers such as volcanic eruptions, as well as uncertainties in the proxy reconstructions and model output. We find that neither a high magnitude of solar forcing nor a strong climate effect of that forcing agree with the temperature reconstructions. We instead conclude that solar forcing probably had a minor effect on Northern Hemisphere climate over the past 1,000 years, while, volcanic eruptions and changes in greenhouse gas concentrations seem to be the most important influence over this period. Tiny point but there's a name typo above: Fulner >>> Feulner. Thanks, BBD. Fixed the typo. Did you read Michael Mann's article about the Schurer paper? No, I hadn't seen that. What MM says supports Feulner & Rahmstorf regarding minimal effects on global average temperature and agrees with Mike Lockwood regarding potential regional effects (eg cold N European winters etc). 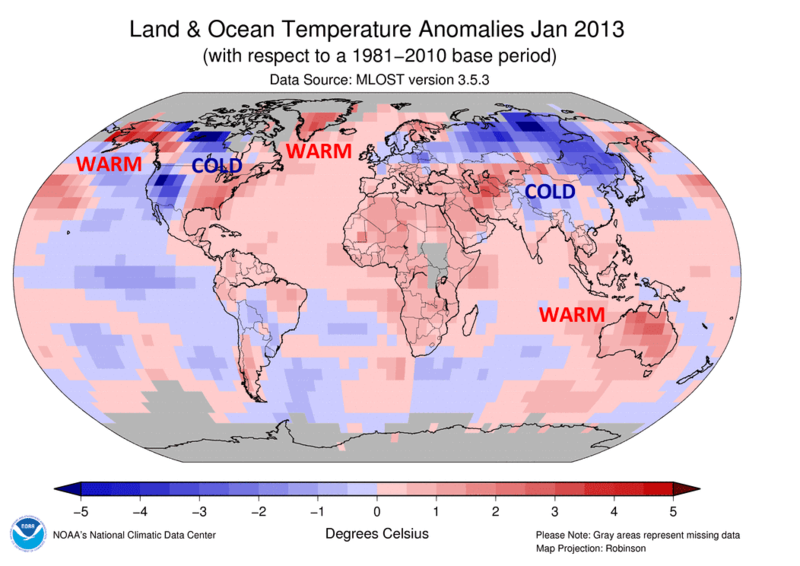 All very interesting; no new ice age in sight and zero comfort for proponents of BAU.